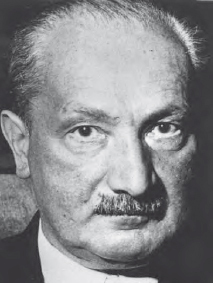 Martin Heidegger (1889–1976) was the phenomenological “ontologist” who first united existentialism with phenomenology, but later revealed that his true concern was ontology. He is considered one of the titans of Western philosophy and had more direct enduring influence over twentieth century continental philosophy than any other thinker. Heidegger wrote extensively on the history of philosophy, developing his own phenomenological analyses. His main books include his doctoral dissertation The Doctrine of Judgement in Psychologism (1914), his habilitation (in Europe, Ph.D.s write two dissertations, one to get a degree as a scholar and the second to qualify them to teach on a university level) The Doctrine of Categories and Signification in Duns Scotus (1914), his most famous Being and Time (1927), and then Introduction to Metaphysics (1953), What Is Called Thinking (1954), What Is Philosophy? (1956), On the Way to Language (1959), Nietzsche I and II (1961), and Phenomenology and Theology (1970). Transcripts of Heidegger’s lectures were partly published in 1975 (the complete works would constitute over 100 volumes). Heidegger is also known for articles on art and poetry, as well as his essay The Question Concerning Technology. Martin Heidegger was a phenomenological ontologist who united existentialism with phenomenology (AP).